Charles Jordan Alewa Amini, known as CJ Amini born April 14, 1992 in Port Moresby, Papua New Guinea is a Papua New Guinean cricketer. 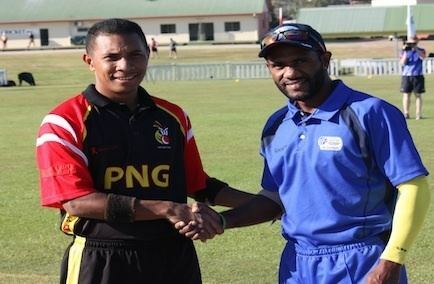 Charles led Papua New Guineas successful campaign in the ICCs East-Asia Pacific Under-15 Cricket 8s in 2006/07. He was part of the squad in the Under-19 Cricket World Cup in Malaysia in 2008, and went on to take eight wickets in the Qualifiers for the Under-19 Cricket World Cup in New Zealand in 2010. Amini made his Twenty20 level for Papua New Guinea in November 2013. In December 2013, he was signed a rookie contract by Big Bash League team Sydney Sixers for BBL-3. Amini who hails from a family with deep cricketing roots. His grandfather, Brian and father Charles, both captained Papua New Guineas senior side while his brother Chris was also a Papua New Guinea senior and Under-19 captain. His mother Kune led the Papua New Guinea womens team as well. His aunt, Cheryl Amini also played for the womens national team.